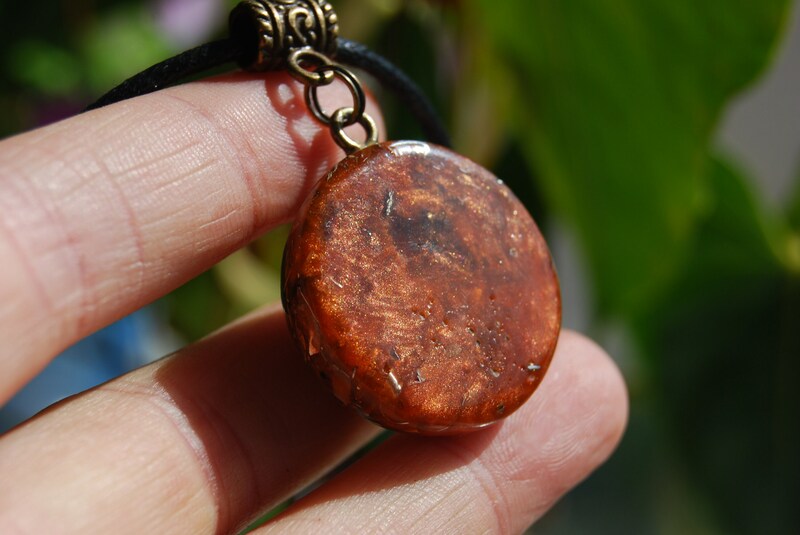 This lovely 2.7 cm / 1.1" in diameter orgone pendant contains brass, aluminum and copper shavings. 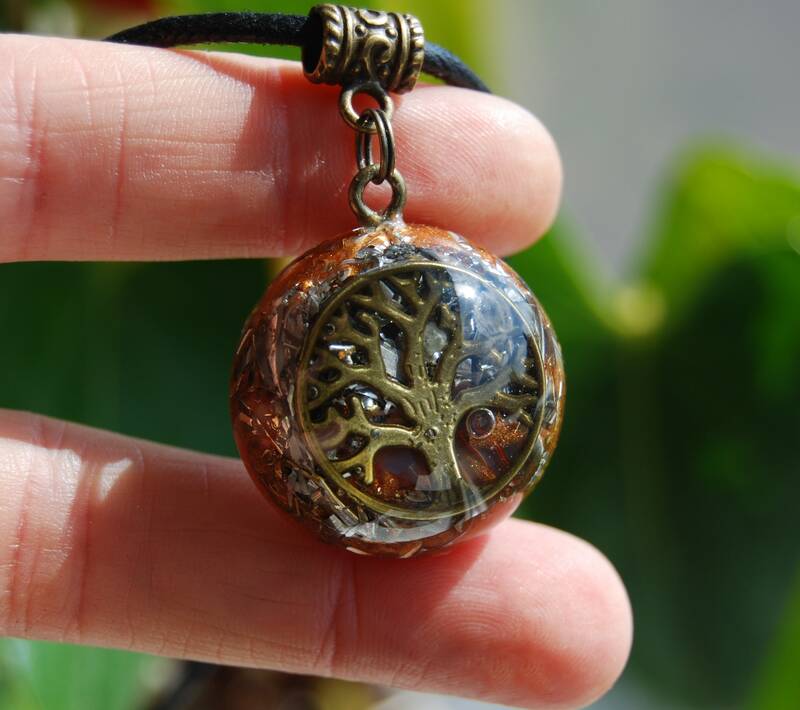 The main stone is Carnelian Agate in the front behind the Tree of Life. 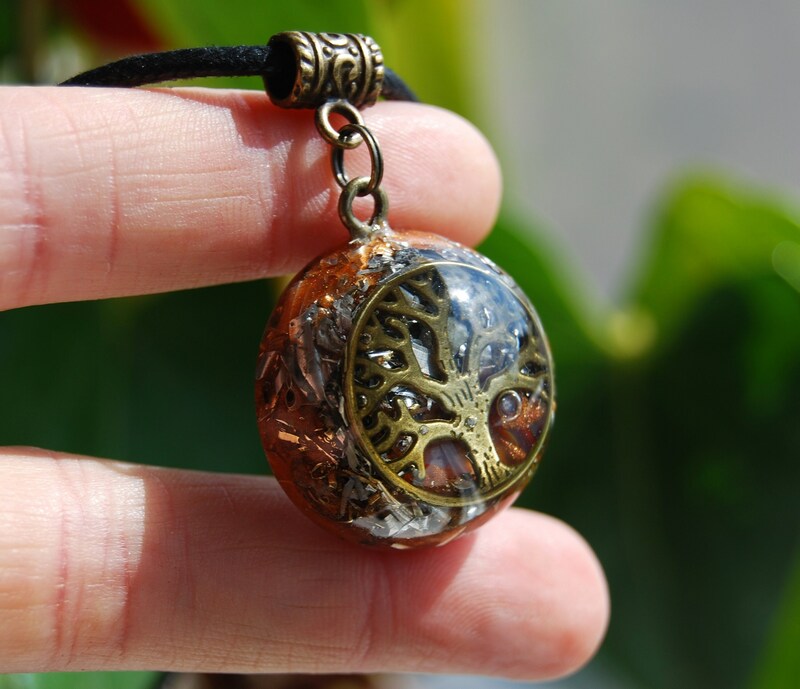 It furthermore contains Pyrite (to enhance), Rhodizite (to amplify), black Tourmaline (to ground and protect), Selenite (to charge and clean) and clear Quartz (for piezo electric effect) all within a durable polyester resin setting for optimal shrinkage/pressure on the quartz. 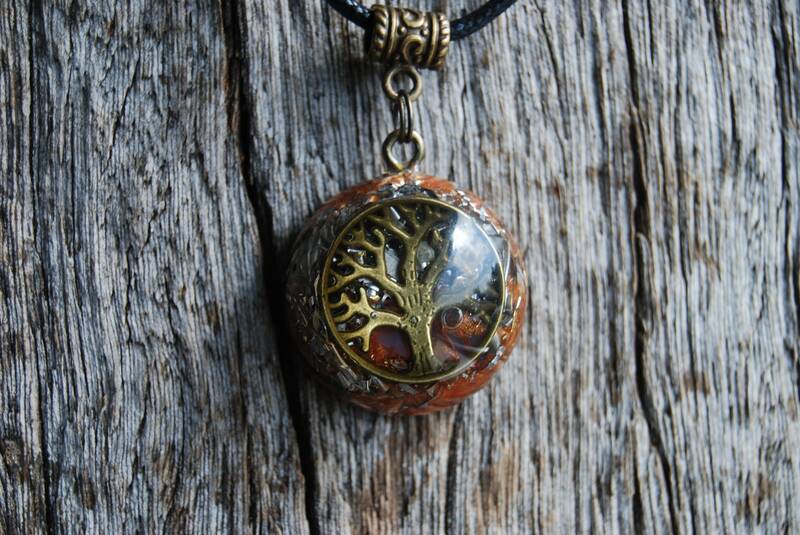 You will get the pendant as shown in het pictures. It has lots of different metal shavings which is required for the orgonite to properly work according to William Reich's research. You will get the pendant as shown in the pictures. Carnelian is an excellent stone to use to cleanse other stones. It is also wonderful at helping to eliminate and reduce anger and provide the wearer of a calmer more serene place in one’s mind, body, and soul. 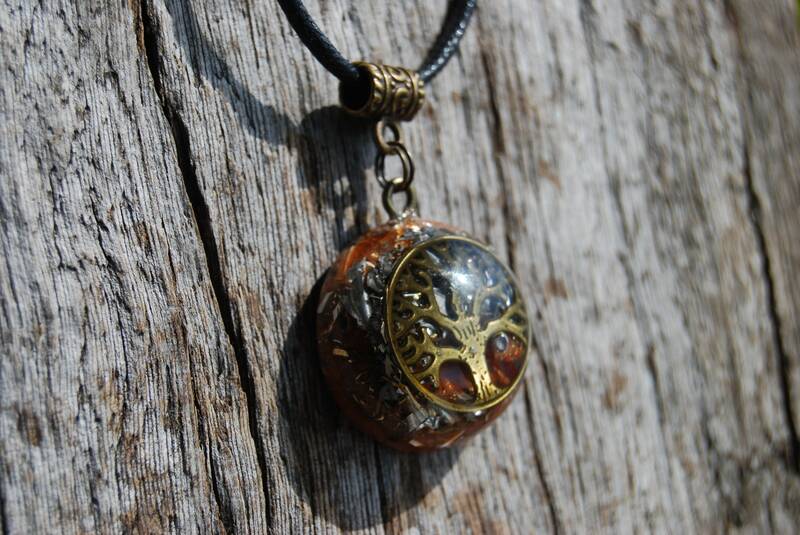 It is said that Agate will improve one’s memory and concentration as well as increasing stamina. Assisting in discerning the truth, as well as encouraging honesty from all those in it’s presence. 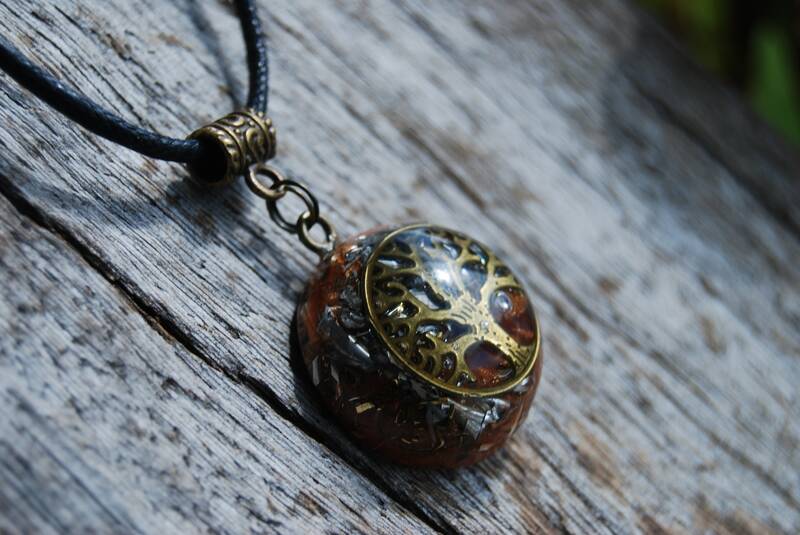 It is said to enhance personal courage, protect against danger. Providing a calming influence, preventing insomnia and used to insure pleasant dreams. This is THE stone everyone should have for protection. This group of stones are variegated chalcedony. The agate is one of the oldest stones in recorded history. Agates attract strength. Agate is a protection from bad dreams. It also protects from stress and energy drains. Agates have been used in jewelry since Biblical Babylonian times. They were used to ward off storms. They were prized gems in antiquity. The Base Chakra is located at the tail bone or base of the spine. It is also called the Root Chakra. Red carnelian stones are especially helpful in this area. They help remove blockages that suppress important information concerning yourself and your purpose on Earth, benefits that support carnelian meaning. The Base Chakra is the source of spiritual and physical energy. An unbalanced Base Chakra will result in low energy levels and enthusiasm, resulting in the need to find constant stimulation. A balanced Base Chakra results in renewed stamina and strength. Spiritual energy and a healthy sense of your own power as well as a feeling of independence are benefits of good balance within this chakra, in keeping with carnelian meaning.